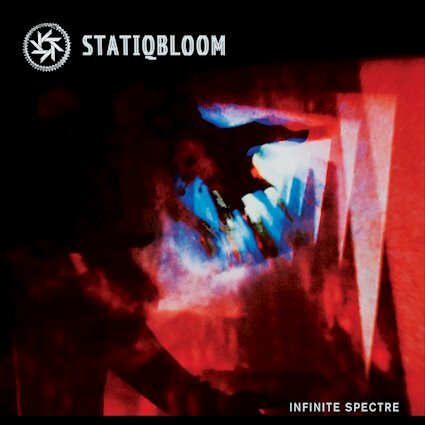 Powerful, ominous, weird, these are all ways to describe the latest EP from Statiqbloom, the almost terrifying Infinite Spectre. This is an album that touches on many sides of the industrial genre yet marries itself to none of them. Brooklyn's favorite post-industrial duo have been very busy lately, and this album feels like a culmination of sorts. It feasts on minimal arrangements that still manage to bring in strange layers and a sense of existential horror that will keep you up at night. Fans of the bizarre will fall in love. There is a breadth to this record that makes it exciting. There are powerful dancey parts, but these are counterbalanced with sounds akin to the gnashing of teeth on broken glass. The potent nihilism of these tracks puts them a fair bit further along then the bands peers in more 80s horror themed acts. While there are certainly 80s elements here, Statiqbloom seem to be pulling from a variety of sources as they construct this record. The brooding majesty of this album can at times boggle the mind, but it also hints at a project that has a sense of cheerful misery, a look at the world inspired by the fact that we are all going to die anyway. You're going to find your head bobbing to these beats and your mind racing with the realization that this is true horror realized. As much as your body might pulse with the rhythm it will be in an unholy dance, a sort of twisted effigy as you realize that this is the music your mother warned you about. Almost out of some sort of 80s sci fi movie it's hard not love the bleak and forboding soundscapes that Statiqbloom so easily unleash upon us. Come joing the groove and reflect on the weird - it's all that we can do.